10kg, 40kg or 50kg packed in the qualified gas cylinder or packed according to the demands. Circuit Breaker,high-voltage Transmission Line, CIS, Large Cable Coil, Mutual Inductor, Lightning Arrester. Stable. Non-flammable. Explodes On Contact With Disilane. Reacts With Sodium. 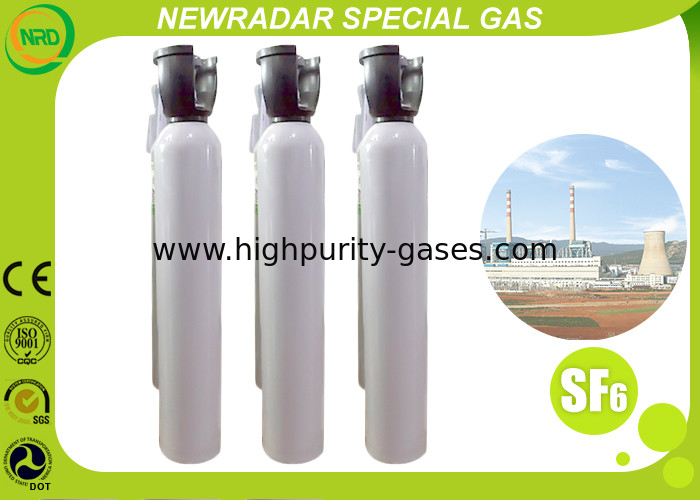 Electronic Gases Sulfur hexafluoride (SF6) is a colorless in-noxious and non-flammable gas at atmospheric temperature.. It is chemical stable with good insulation. 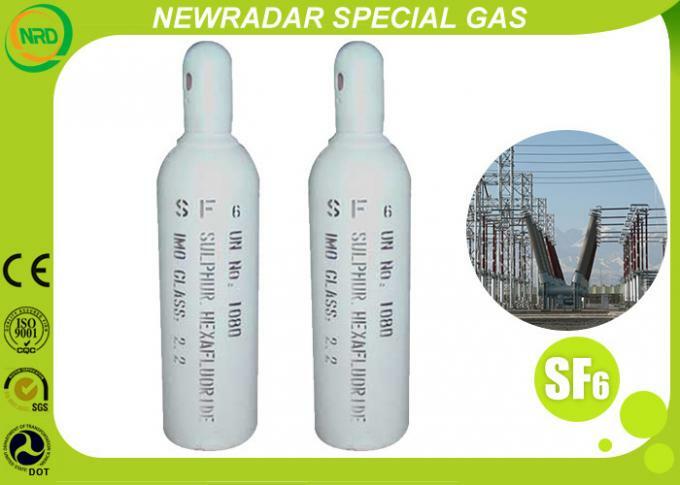 Sulfur hexafluoride (SF6) is an inorganic, colorless, odorless, non-flammable, extremely potent greenhouse gas, which is an excellent electrical insulator. SF6 has an octahedral geometry, consisting of six fluorine atoms attached to a central sulfur atom. It is a hypervalent molecule. Typical for a nonpolar gas, it is poorly soluble in water but quite soluble in nonpolar organic solvents. 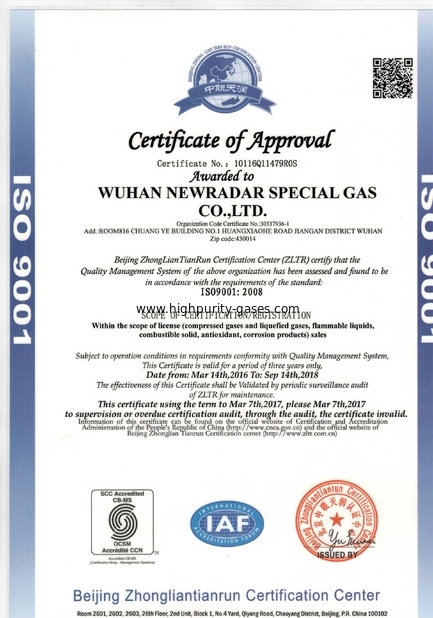 It is generally transported as a liquefied compressed gas. This substance undergoes chemical reactions only under relatively severe circumstances. They are resistant to ignition, although they may become flammable at very high temperatures. They may be resistant to oxidation reduction, except in the most severe conditions. These materials may be nontoxic. They can asphyxiate. Contact of very cold liquefied gas with water may result in vigorous or violent boiling of the product and extremely rapid vaporization due to the large temperature differences involved. If the water is hot, there is the possibility that a liquid "superheat" explosion may occur. Pressures may build to dangerous levels if liquid gas contacts water in a closed container [Handling Chemicals Safely 1980]. Vapors may cause dizziness or asphyxiation without warning. Vapors from liquefied gas are initially heavier than air and spread along ground. Contact with gas or liquefied gas may cause burns, severe injury and/or frostbite. Fire may produce irritating, corrosive and/or toxic gases. 7.Some may burn but none ignite readily. Containers may explode when heated. Ruptured cylinders may rocket. and circuit breakers,high-voltage transmission line, CIS, large cable coil, mutual inductor, lightning arrester. For the casting of magnesium. SF6 is used in the electrical industry as a gaseous dielectric medium for high-voltage circuit breakers, switchgear, and other electrical equipment, often replacing oil filled circuit breakers (OCBs) that can contain harmful PCBs. SF6 is used to provide a tamponade or plug of a retinal hole in retinal detachment repair operations in the form of a gas bubble.SF6 is used as a contrast agent for ultrasound imaging. Sulfur hexafluoride microbubbles are administered in solution through injection into a peripheral vein. Sulfur hexafluoride was the tracer gas used in the first roadway air dispersion model calibration; this research program was sponsored by the U.S. Environmental Protection Agency and conducted in Sunnyvale, California on U.S. Highway 101.Sulfur hexafluoride is also routinely used as a tracer gas in laboratory fume hood containment testing. 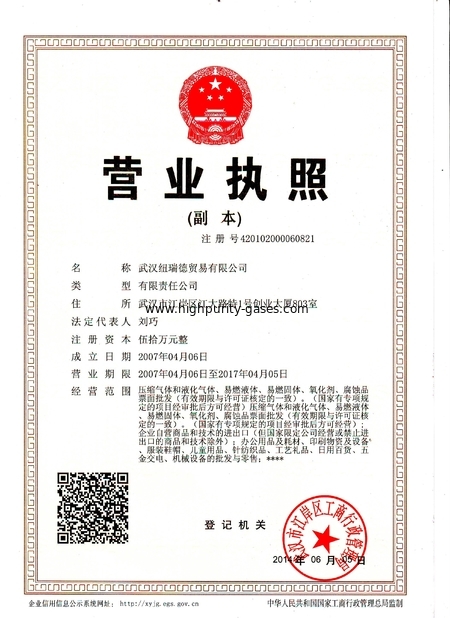 Application: Circuit breaker,high-voltage transmission line, CIS, large cable coil, mutual inductor, lightning arrester.